Snrky: Can we do that, or do we have to hire her back first? Can we do that, or do we have to hire her back first? So many process and role related posts. I think I need some bare metal tech snark soon. I need a break from crafting these when reality, like pager lists with no participants, printers that are fallow for a week because no one just reboots them, source control system that require two weeks and change control board despite no ties to any other systems, and communication that I'm supposed to know because they told someone in my chain, is day-to-day reality. I wonder how much humor I can find in GraphQL. Snarky: Jill? The project manager? 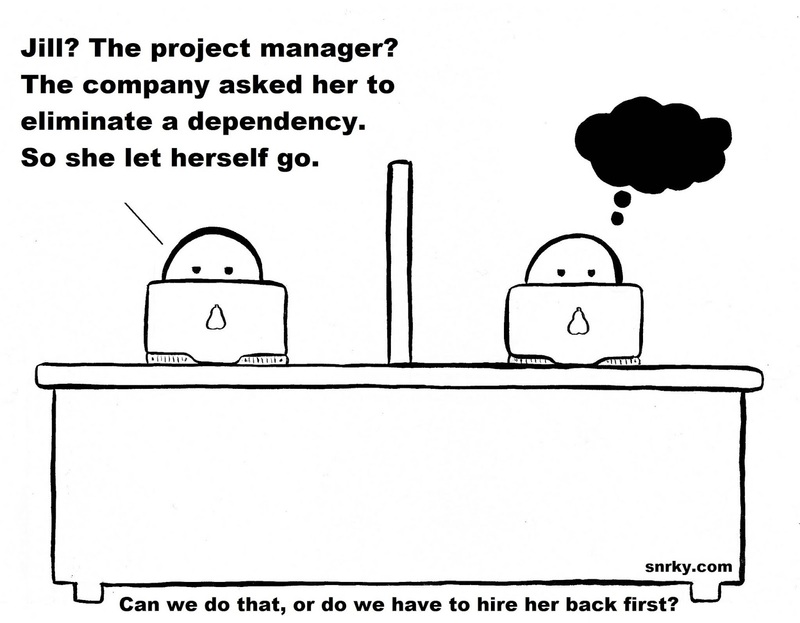 The company asked her to eliminate a dependency. So she let herself go. Title: Can we do that, or do we have to hire her back first?